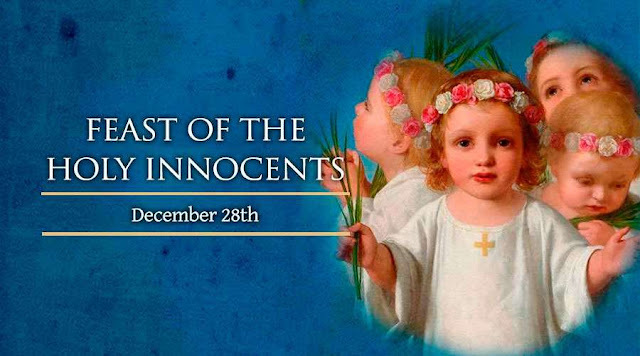 Today, December 28, we celebrate the Feast of the Holy Innocents—those male babies put to death by a jealous Herod shortly after the birth of Christ, following his visit with the Magi. The fourth day of Christmas commemorates these baby boys, who are considered martyrs -- the very first martyrs. (Saint Stephen, whose Feast we celebrated 2 days ago, was the first martyr of the Church Age). As Herod ordered the death of children two years or less, in or around the small town of Bethlehem, the number of these Holy Innocents was probably no more than 25. Nonetheless, these innocent babies are glorious martyrs who died not only for Christ, but in His place. "Blessed are you, Bethlehem in the land of Judah! You suffered the inhumanity of King Herod in the murder of your babes and thereby have become worthy to offer to the Lord a pure host of infants. In full right do we celebrate the heavenly birthday of these children whom the world caused to be born unto an eternally blessed life rather than that from their mothers' womb, for they attained the grace of everlasting life before the enjoyment of the present. As we contemplate the martyrdom of the holy innocents, our Christmas joy is tempered by sadness. We are reminded of the sacrifice and suffering that love sometimes requires, and look to this army of “infant martyr flowers” who now sit in the glory and presence of the Lord! All aborted, abused, tortured, mistreated, unwanted babies and children are Holy Innocents in my opinion. There will be an answering for their treatment.